Simply, hydrate the gel powder in the cells, immerse in clean water. Smaller cells will require four to five minutes to completely hydrate sheet(s). The longer you immerse the sheets in water, the fully hydration will process. Please remove the gel sheets from water, shake off excess water and allow time to drip dry. They can be dried by hand to quicken the process if so desired. Gently squeeze the gels one at a time to expel excess. Excess moisture can be left in the cells. Keep the plastic side down. Do not place the fabric side against the freezer surface or other fabric surfaces when freezing the sheets. The fabric side will freeze to itself and also to the freezer surface. They will not freeze to the plastic side of the gel sheet, so multiple sheets can be stacked in the freezer. Processing large sheets, that do not lie flat in the freezer, roll the sheet up with the plastic side in, and then protect the exposed fabric with the plastic side of another piece of a gel sheet. The sheets can be used again and again but over time, the cells may not fully hydrate as the cells begin to crystallize. Cut sheets when dry, after hydration or when frozen but best and suggested when dry. Keep in mind, that the correct size of the cells are best determined when hydrated for your use. Wrap your container/cooler with as many sheets that will protect your perishables/temperature sensitive goods. The sheets will be flexible when frozen. This will help product to maintain more consistent temperatures. Also, this will offer more weight distribution that will maintain in same place during your shipment. The cells contain a special super absorbent material. 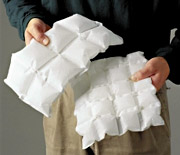 These pockets are quilted between one water-permeable sheet and one water-impermeable sheet. To Use, simply cut the sheet to the size you want, soak, freeze and place in your shipping container. The sheets are light and compact during storage. They are completely safe to handle when dry to hydrated will only a fraction of space required to store. Please call our team, to discuss any cooling concerns with shipments that you may have.